Map highlighting the Glengorm gas discovery in the UK Central North Sea. Source: Source: OGA, Rystad Energy UCube. A major new gas find is the largest discovery in the UK offshore for eight years. 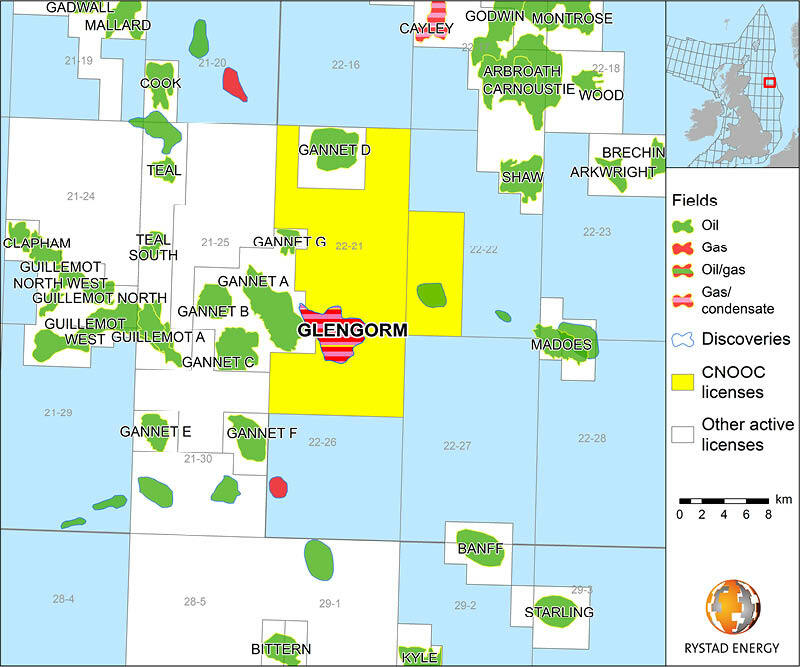 Glengorm, announced by operator CNOOC in late January 2019, is reported to hold recoverable resources of 250 MMboe. It is located in Licence P2215 in the Central North Sea in waters of approximately 80m and was drilled to a total depth of 5,056m. The well encountered net gas and condensate pay zones with a total thickness of 37m in a high quality Upper Jurassic reservoir. CNOOC Petroleum Europe Limited, a wholly-owned subsidiary of CNOOC Limited, is the operator of Licence P2215, holding 50% interest, while Total and Euroil both hold 25%. According to Total, Glengorm lies close to existing infrastructure operated by the company, suggesting tie-back possibilities, such as to the Elgin-Franklin platform or the Culzean project, which was discovered in 2008 and scheduled to start production this year. It also presents some upside potential with several other prospects already identified on the same block. This discovery in the mature UK Central North Sea province has caused great excitement, confirming the considerable remaining potential in the region, especially since Glengorm was first mapped as a prospect around 20 years ago. However, as the gas is reservoired in a complex high-pressure, high-temperature environment, further evaluation and development could prove both technically challenging and expensive. Some recommended reading relating to, or similar in content to, the exploration of oil and gas offshore UK. Well known for its challenging seismic imaging, the Central North Sea still harbours a wide range of exploration opportunities. Where will we find Arctic Oil and Gas resources and what challenges lie ahead?